This recording was made at Brixton Academy in London, October 22, 2000. 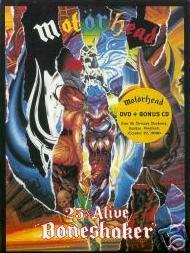 This was the celebration of 25 years of Motorhead and several guests appeared, amongst others Eddie Clarke and Brian May. 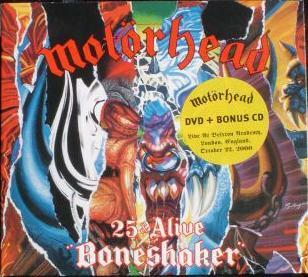 Boneshaker was the first DVD release ever to be released in two packagaing formats - in DVD packaging (cat no 555-72797) and in a CD-size digipack (cat no 555-72799) - and it was reased by SPV November 30th 2001. The smaller one is often referred to as a Digi pack but both versions are actually digipacks (thick folded paper package). Both formats also included an audio CD with 17 of the songs. According to the German package it should feature 6 songs from Wacken but two were excluded in the last minute. The same thing was made with the video for ”I Don´t Believe A Word”. 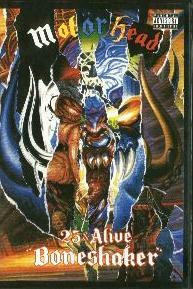 On later editions, such as the US version, this has been corrected on the rear cover. 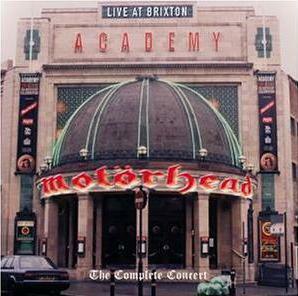 Two years later, in 2003, Steamhammer released the whole recording again as a double CD, called "Live at the Brixton Academy - The Completet Concert". This release, or re-release, was nothing the band had been informed of when it was done. It was also released in Russia. And in 2009 the Italian label Night of the Living Vinyl released a vinyl version, a 2 LP set.